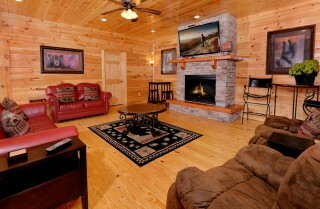 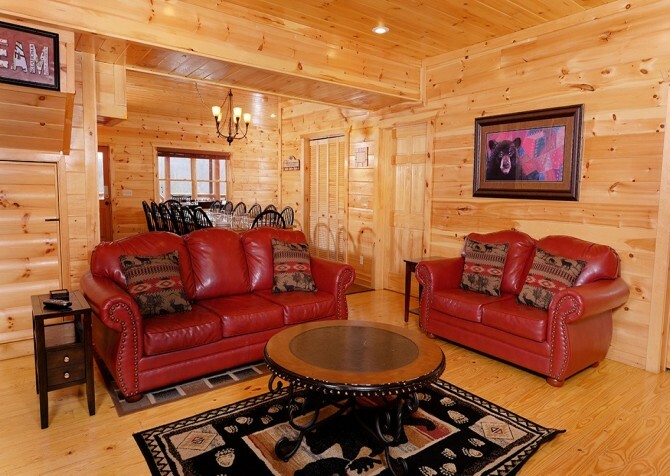 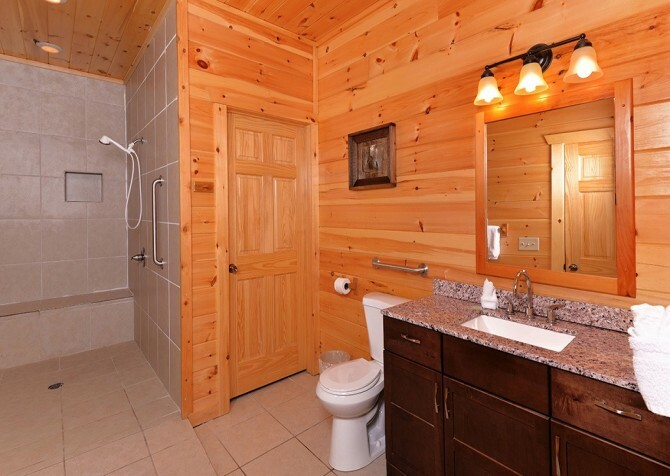 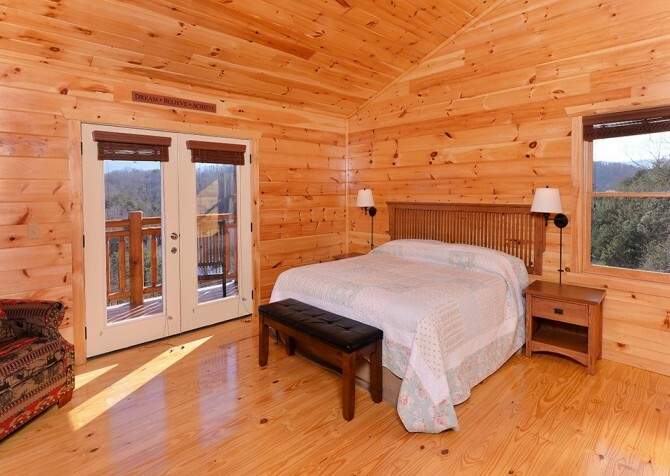 Sitting high in the Smoky Mountain hills is a large-group cabin that’s designed to please. With its clean, modern design and especially long list of entertaining extras, Splash Mansion is a great choice for anyone planning a large-group getaway to Pigeon Forge. 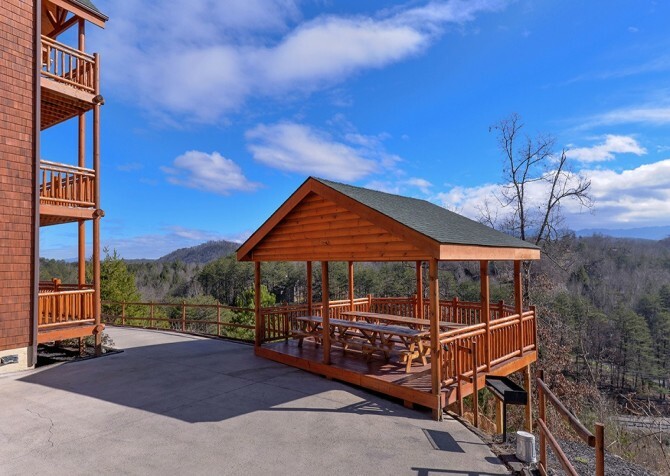 Wedding parties, corporate groups, and families can take advantage of all kinds of playing space in this impressive mountain cabin. 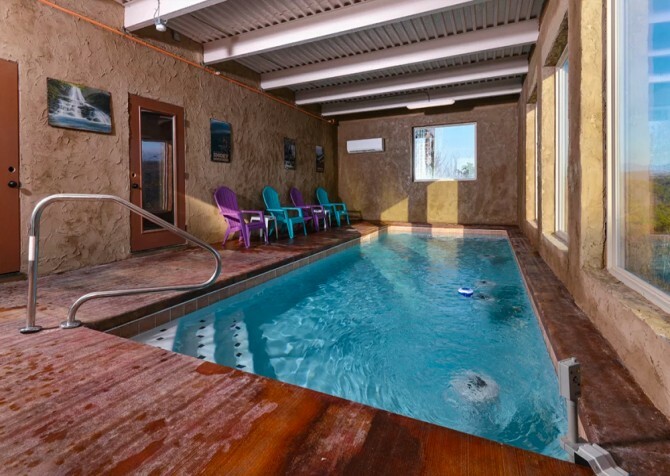 From a fully loaded rec room to a private theater room to an indoor private pool, Splash Mansion can entertain guests of all ages for days! 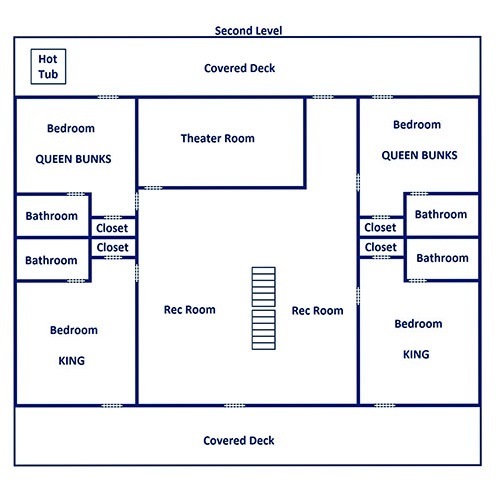 And you’ll have plenty of sleeping space for up to 38 guests with Splash Mansion’s 11 bedrooms and 11 ½ bathrooms. 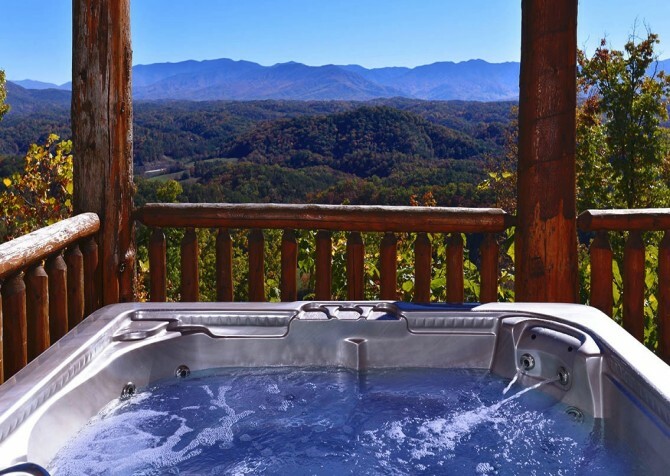 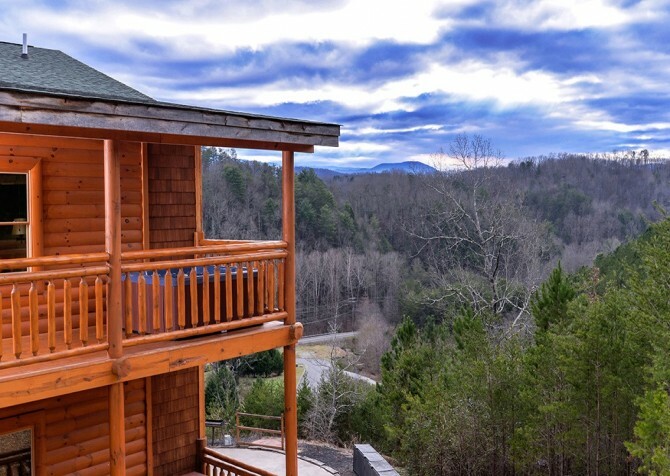 Besides all this, Splash Mansion provides amazing Smoky Mountain views from 3 porches, as well as rocking chairs and multiple outdoor hot tubs to enjoy them from. 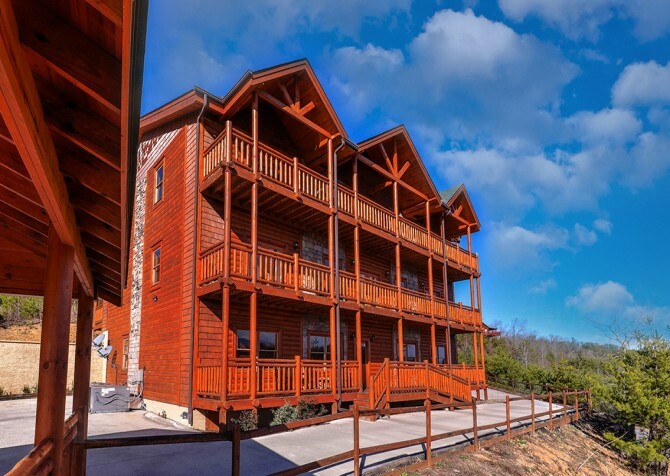 Less than 7 miles from downtown Pigeon Forge, Splash Mansion is just the place to experience a new level of large-group fun in the Smokies this year! Entering Splash Mansion, your group will be wowed by the open, clean, modern feel of this cabin, beginning in the living room. With a red leather sofa, matching loveseat, and coordinating recliners, you’ll have plenty of comfortable places to relax with a cup of fresh-brewed coffee or a glass of iced tea. There’s also a small bistro table with 2 chairs and a corner table with 2 stools—you can use the chairs for extra seating and the tables for games and/or snacks. 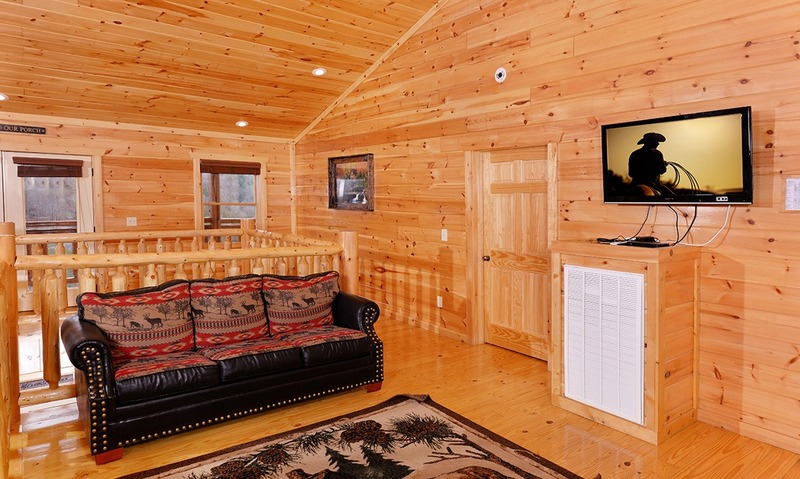 The Splash Mansion living room provides a perfect place to relax during your Pigeon Forge getaway with its huge flatscreen TV. Watch the game as a group, or keep the TV turned off and just enjoy a quiet night in front of this cabin’s electric fireplace surrounded in beautiful gray stonework. 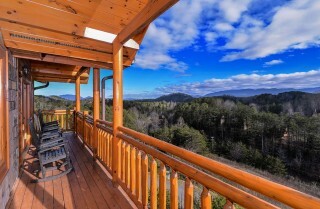 You might enjoy an opportunity to swap stories from your Pigeon Forge adventures earlier in the day. 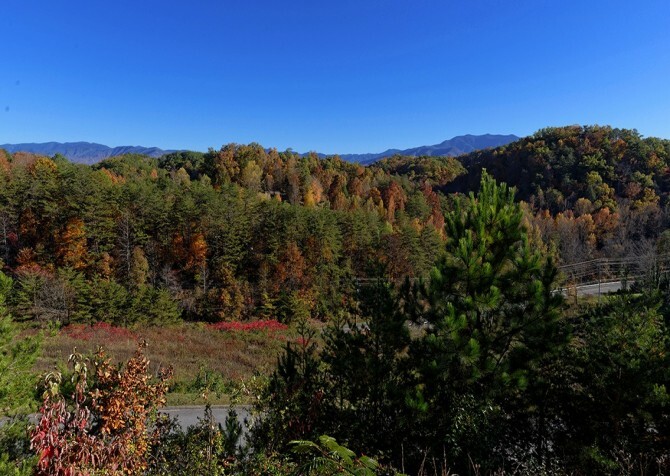 And if you aren’t sure where to take your large group for fun while you’re in town, check out these group activities recommended in the Pigeon Forge area. 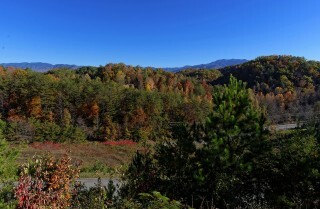 From whitewater to roller coasters to mountain trails, you’re sure to find something for everyone in the Smokies! The Splash Mansion kitchen is everything you need to feed 38 guests during your Pigeon Forge getaway. With nearly double of everything—including sinks, full-size refrigerators, ovens, and electric stoves—you should have all the right tools to cook your favorite homemade meals. The granite countertops and beautifully stained cabinets provide plenty of storage and prep space while you cook. 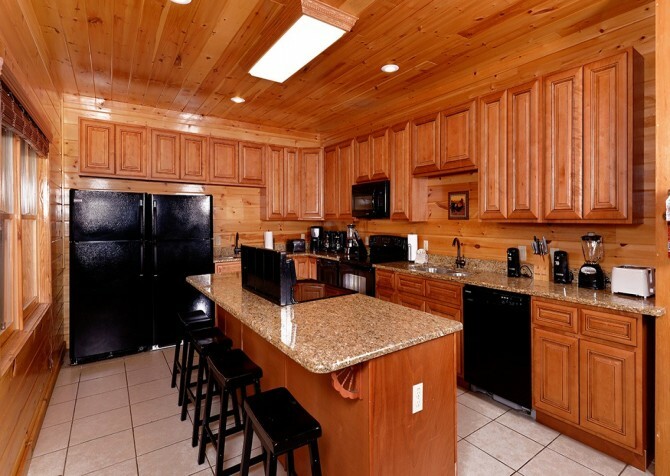 If that’s not enough, in the center of this kitchen is a matching island with extra space for setting out a buffet-style meal, or it can function as a breakfast bar complete with 4 stools. 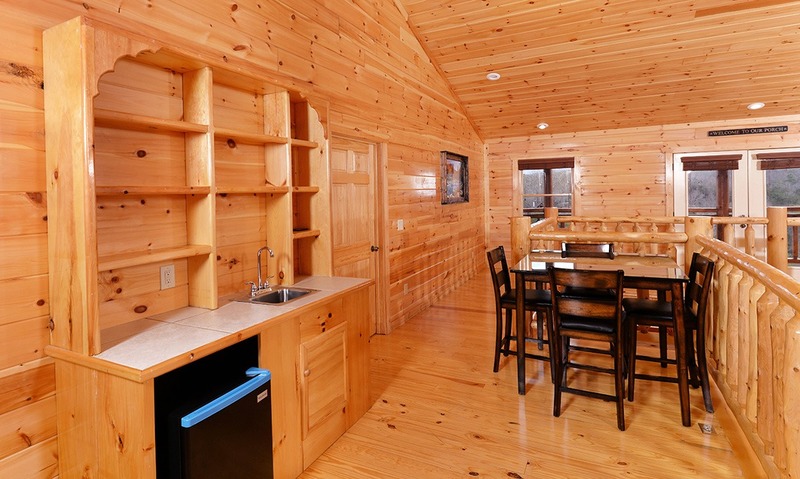 Other handy tools and minor appliances that come with Splash Mansion include coffeemakers, electric can openers, a blender, a knife set, and a toaster. Dining in Splash Mansion is made easy with this cabin’s large dining space that includes a large rectangular table as well as a pub-style table with 4 chairs. 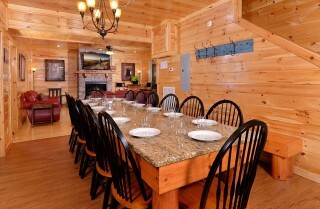 The main dining table in Splash Mansion features a granite tabletop, adding modern flair, and place settings for 14. 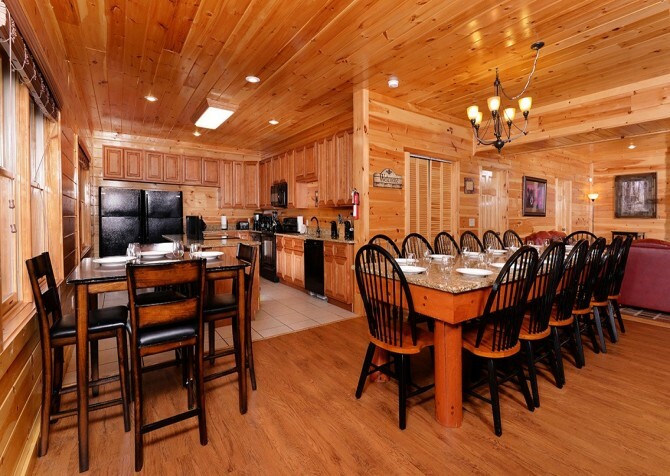 Although you won’t be able to fit your whole 38-person crew in the dining room, the open-concept design of this cabin means guests can enjoy their meals in the comfort of the living room without feeling cut off from the group. And don’t forget about the breakfast bar in the kitchen that offers seating for 4 more! After dinner, bring your group down to the Old Mill for a sweet treat at the Old Mill Creamery. You’ll love their old-fashioned ice cream parlor with new flavors every season as well as the old favorites. 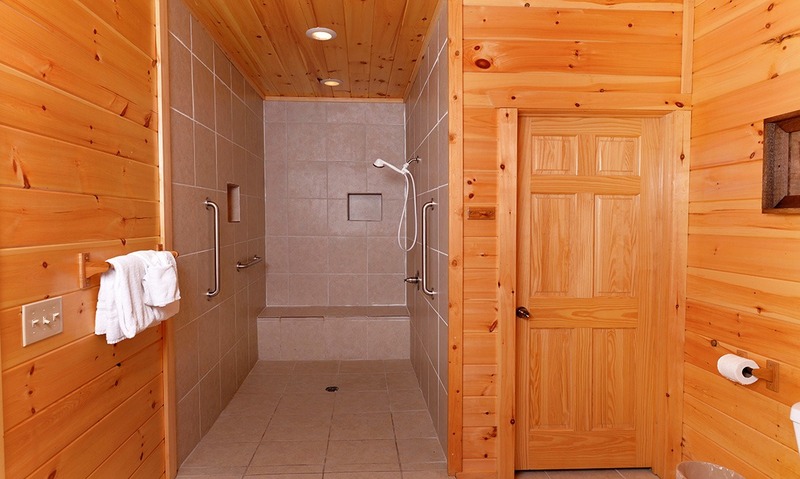 When you’re needing a fun way to entertain your guests, you can try a group outing to the Comedy Barn Theater, or you can save time, money, and gas and simply walk up the stairs to the second floor of Splash Mansion where you’ll find this cabin’s amazing rec room! 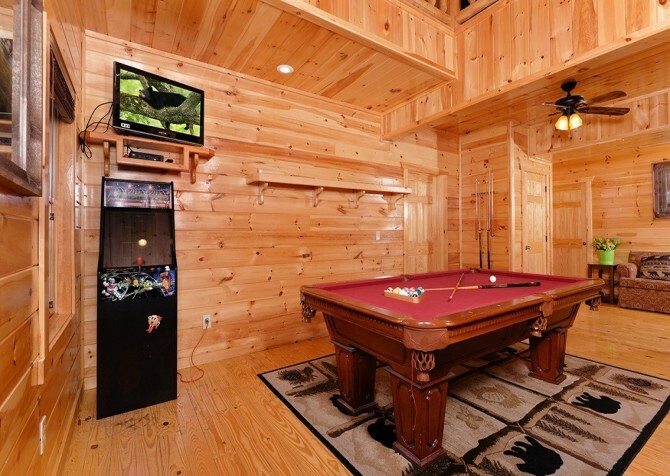 Fully equipped with multiple arcade games, an air hockey table, a pool table, a foosball table, and a flatscreen TV, this room pulls no punches when it comes to in-cabin fun! You’ll also enjoy a wet bar in this space and a comfortable couch where you can recline with your freshly mixed cocktails. 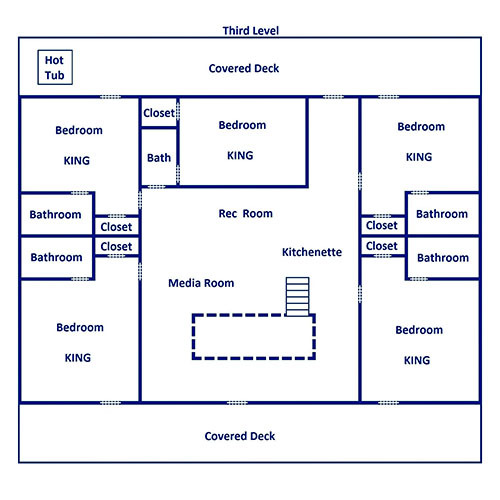 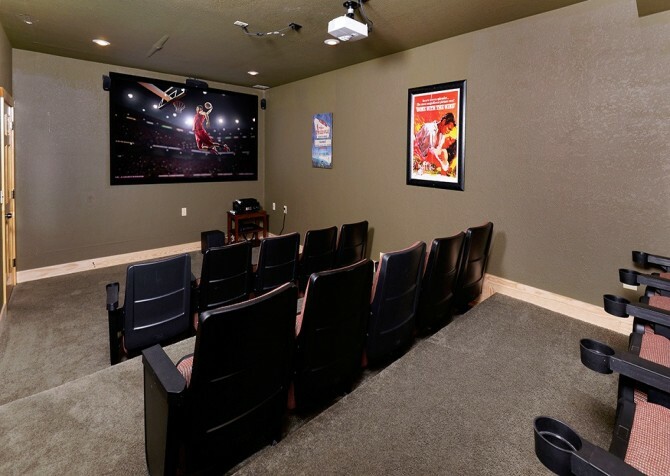 If that’s not enough, Splash Mansion also comes with a media room on the third floor. 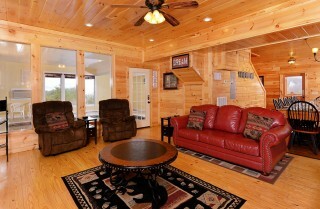 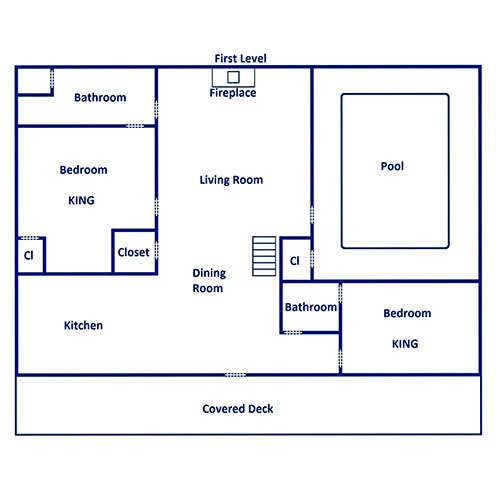 Enjoy a second wet bar, a card table, another comfortable couch and flatscreen TV, and porch access. 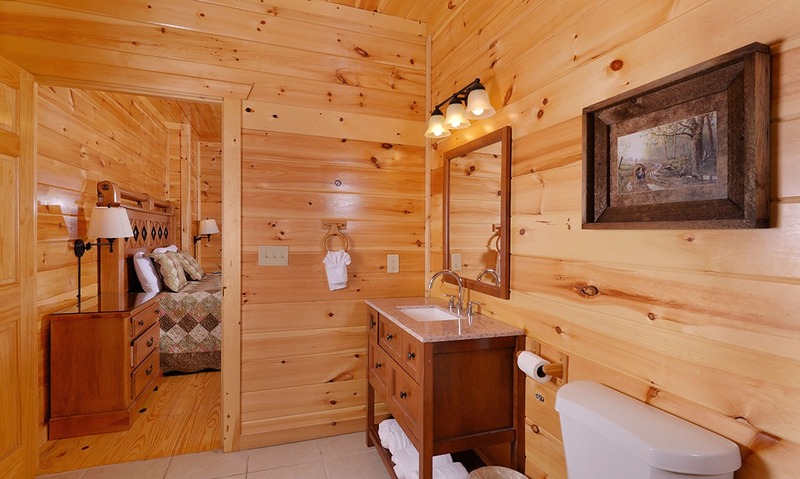 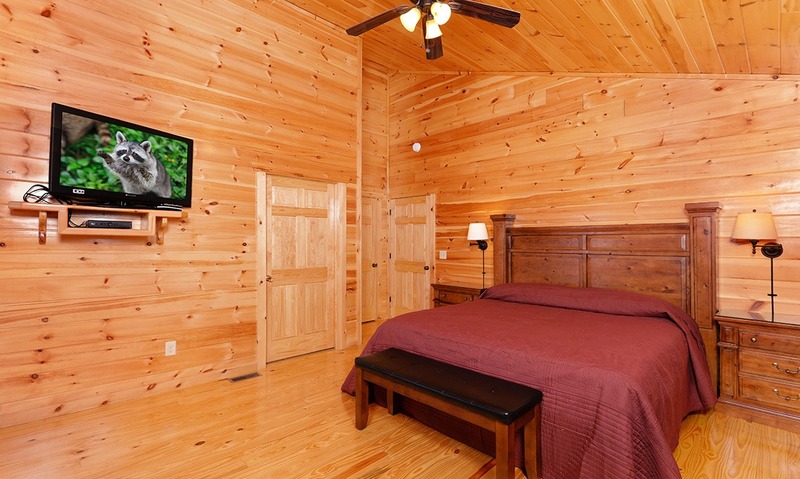 Either room presents plenty of possibilities for fun during your Pigeon Forge getaway! 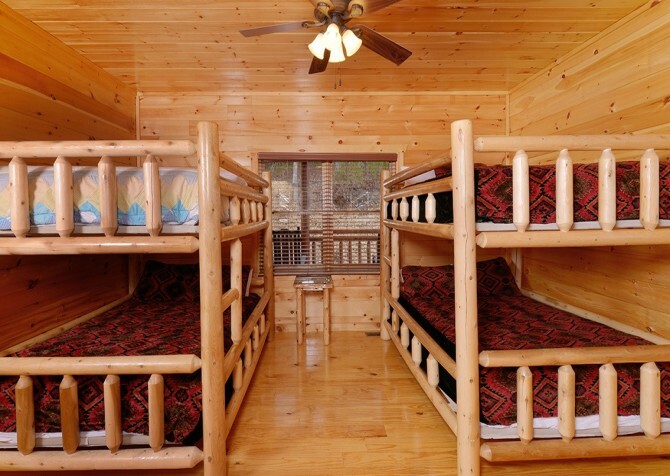 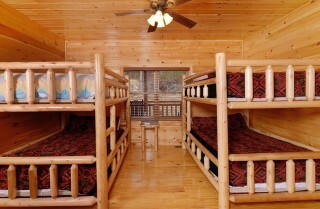 When you’re entertaining a group of 38 in the Smokies, you need plenty of options inside your cabin. Splash Mansion definitely provides yet another fun space: a private theater room! 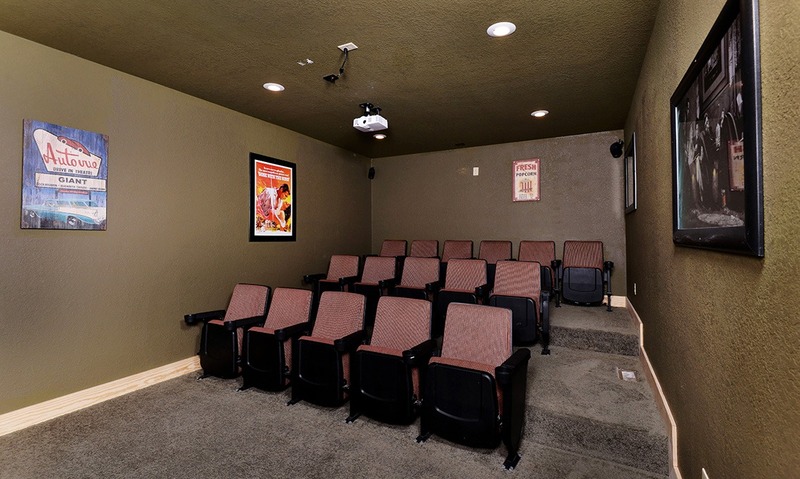 With 16 theater-style chairs in stadium seating, you can get the true movie-theater experience inside Splash Mansion. 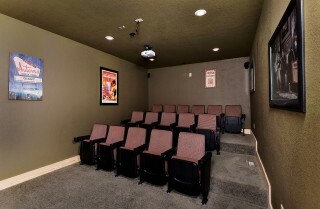 Watch your favorite movies or a new release using the mounted projector and huge screen found in this space. If you’re worried about sacrificing sleeping space by cramming 38 people into one cabin, let Splash Mansion ease your fears. This large cabin perched high in the Smoky Mountain hills offers 11 bedrooms and 11 ½ bathrooms for a large-group getaway that’s as comfortable as it is memorable. 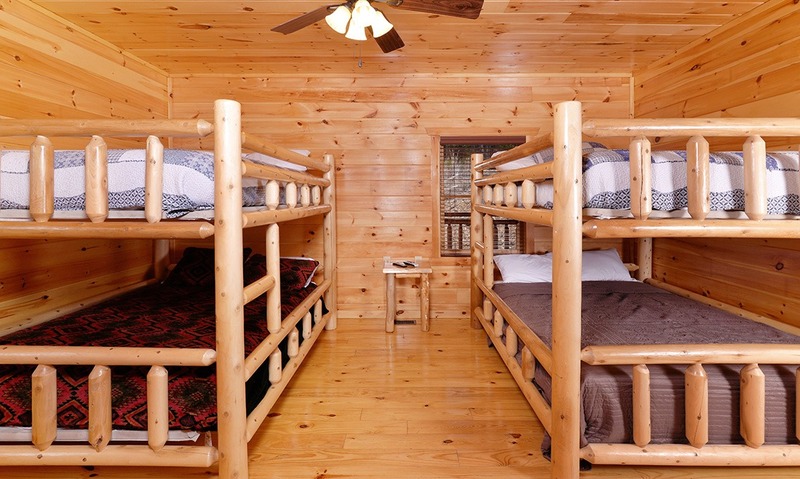 In its 11 bedrooms, Splash Mansion features 9 king-size beds and 4 queen-size bunks. 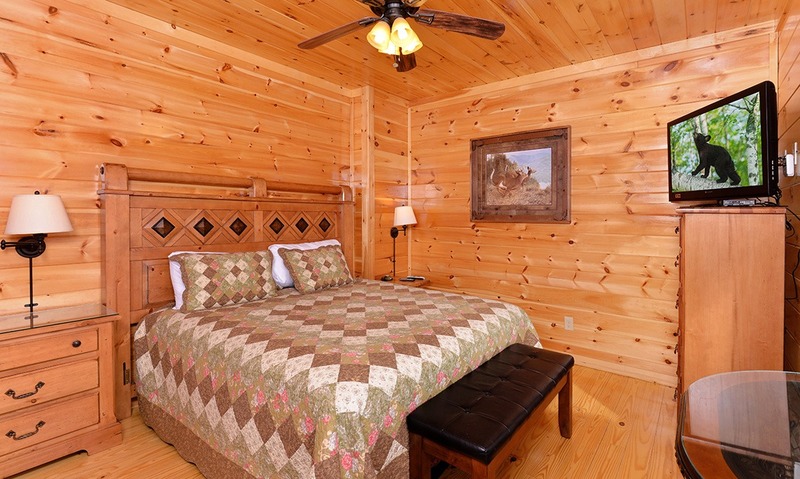 Each bedroom offers a clean, open space filled with homey accents like reading lamps, side tables, ceiling fans, and bureaus. 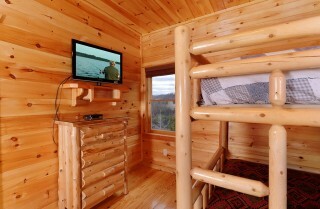 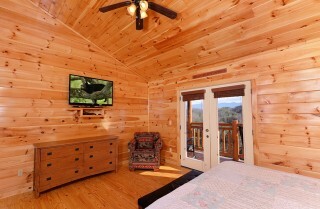 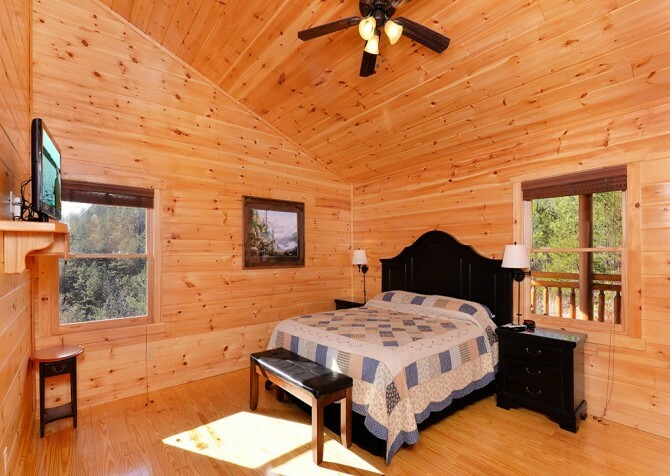 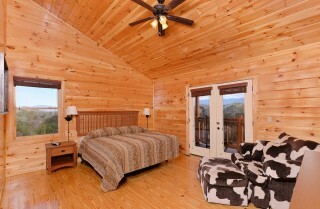 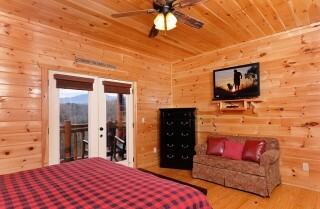 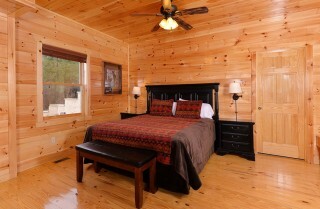 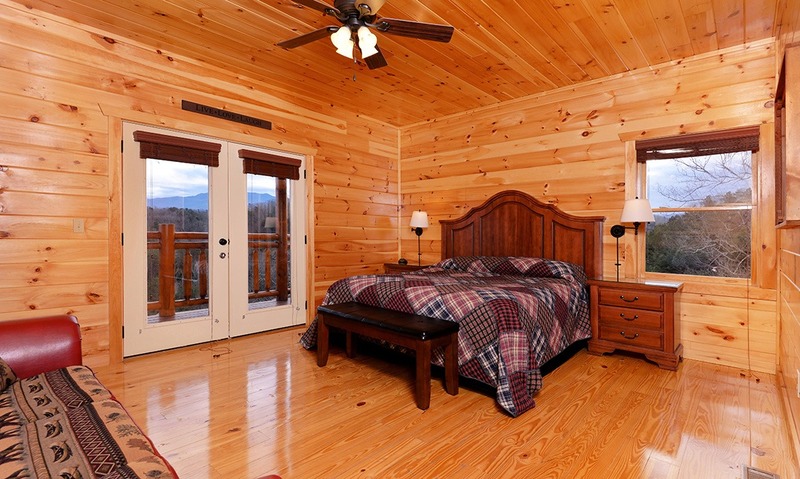 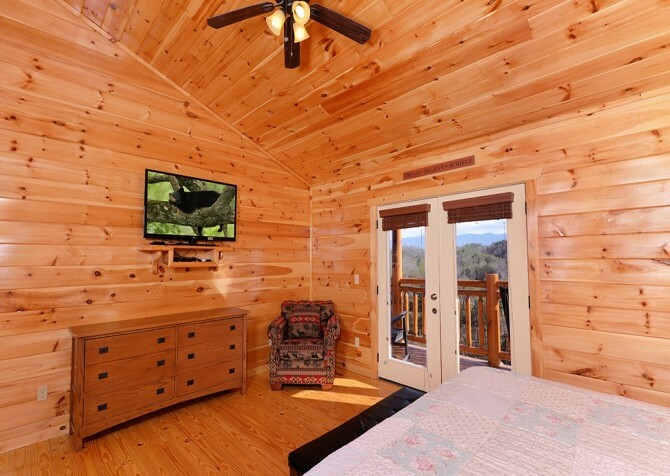 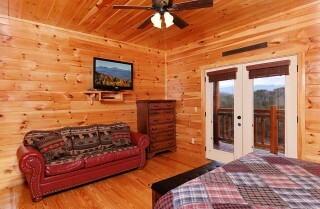 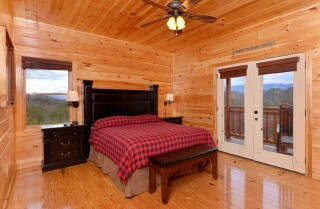 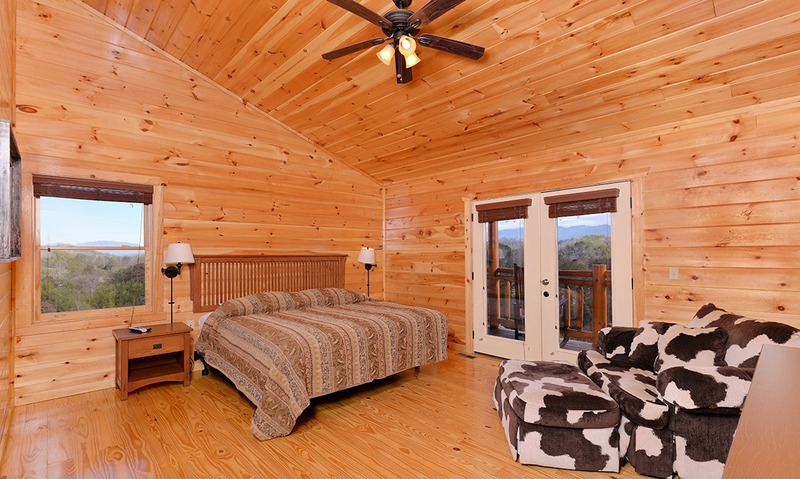 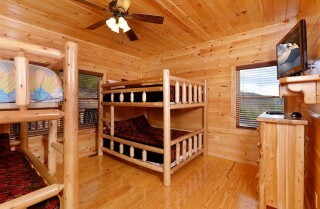 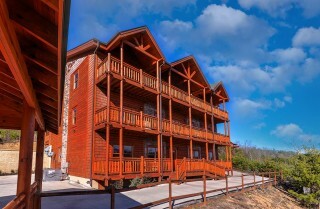 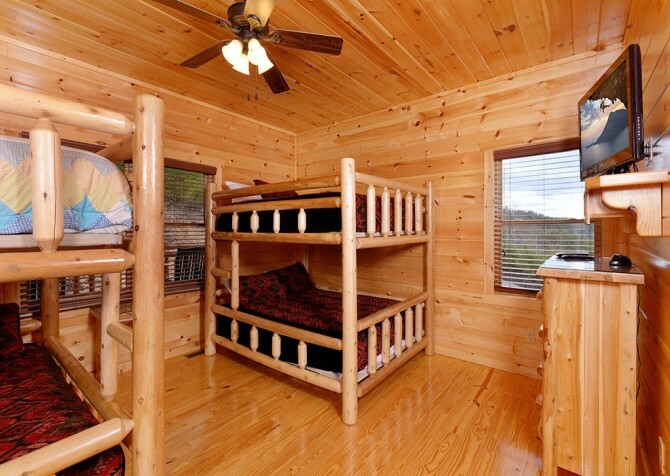 Some bedrooms also come with windows overlooking the Smokies, private sitting areas, and porch access. And, conveniently, every bedroom comes with its own TV so no one has to fight over the remote while you’re away. Something we’re sure you’re going to love about your stay at Splash Mansion are the amazing mountain views offered by this cabin! Because of its towering height, this mansion of a cabin offers impressive mountain views from 3 porches. 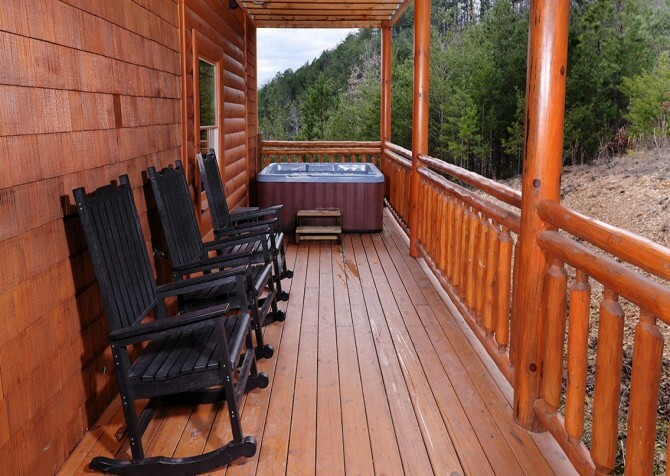 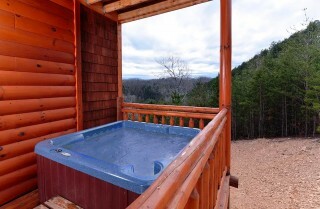 Enjoy these views from a rocking chair or from one of two covered outdoor hot tubs. If that’s not enough, there’s also a separate picnic area in front of the cabin that’s covered, comes with a charcoal grill, and offers your group 2 large picnic tables where you can enjoy a group barbecue or a family cookout. 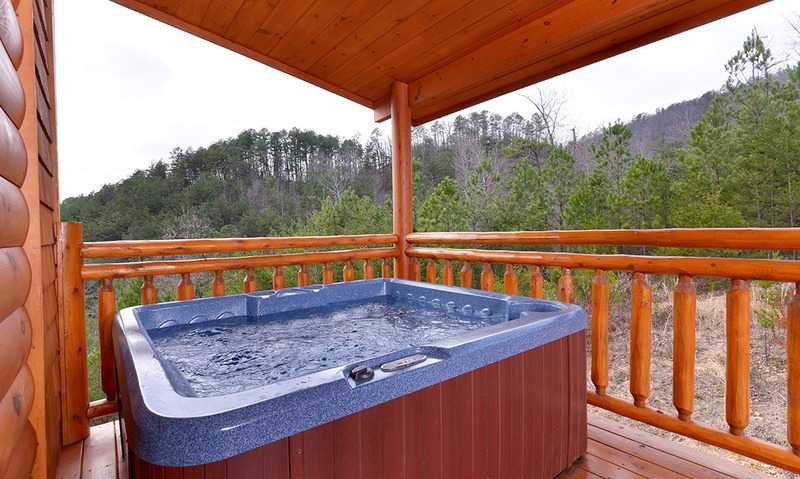 If you want to enjoy the natural swimming holes in the Great Smoky Mountains National Park, you need to plan for your large-group vacation for the summer. And while there are plenty of Smoky Mountain events in the summer to keep you entertained, that may not be the best time for your group to come to Pigeon Forge. 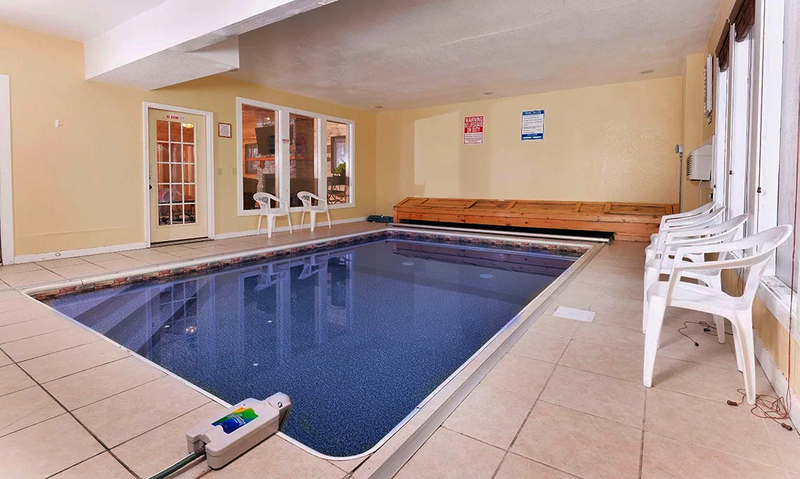 At Splash Mansion, that’s okay! 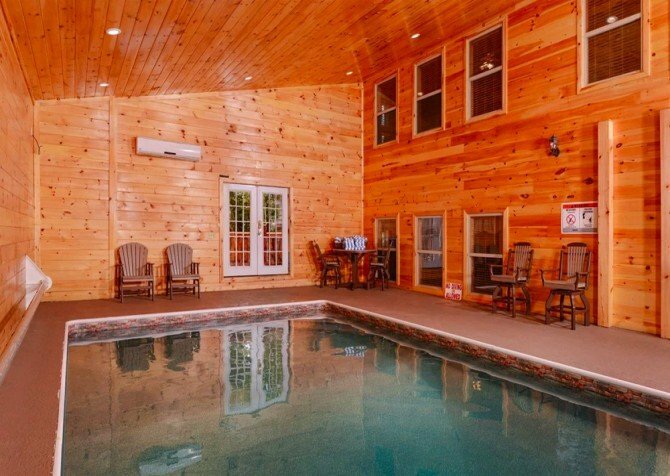 You can enjoy a refreshing dip in the pool - kept at 85 degrees - no matter what time of year you decide to visit, because this cabin comes with its own indoor private pool! 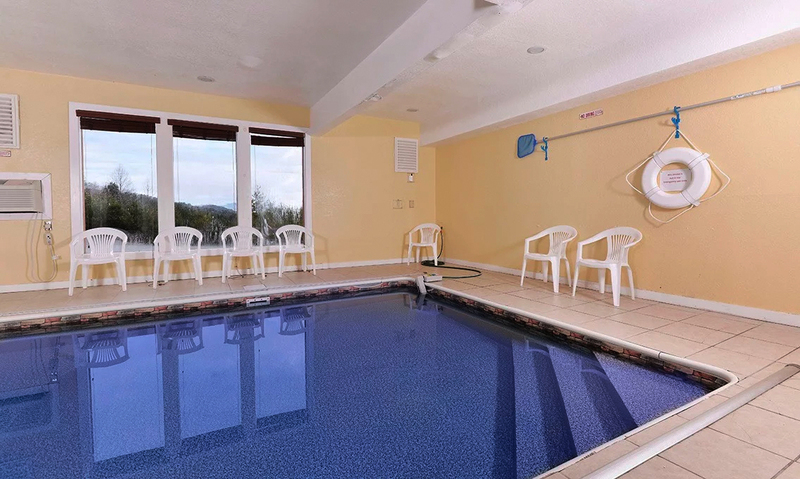 With windows offering impressive mountain views all around, the Splash Mansion pool is definitely going to a popular hangout space during your large-group getaway! 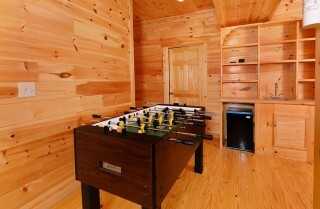 We’ve already listed an amazing amount of amenities that come with Splash Mansion, but that list isn’t complete yet. 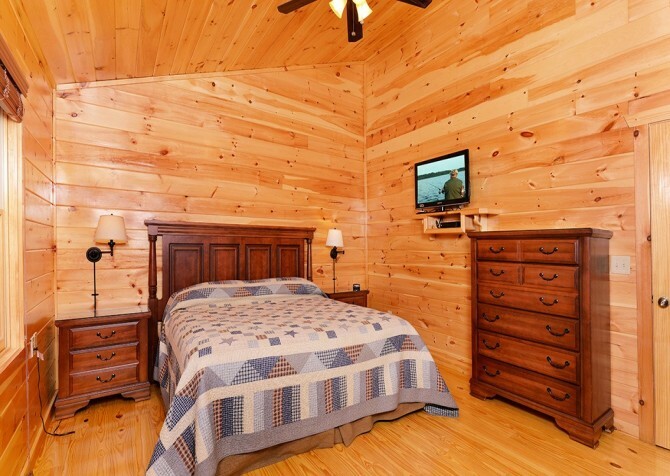 This cabin also offers your group high-speed Wi-Fi, access to a Blu-ray player, 10 DVD players, a VHS player and CD player, and a washer/dryer! 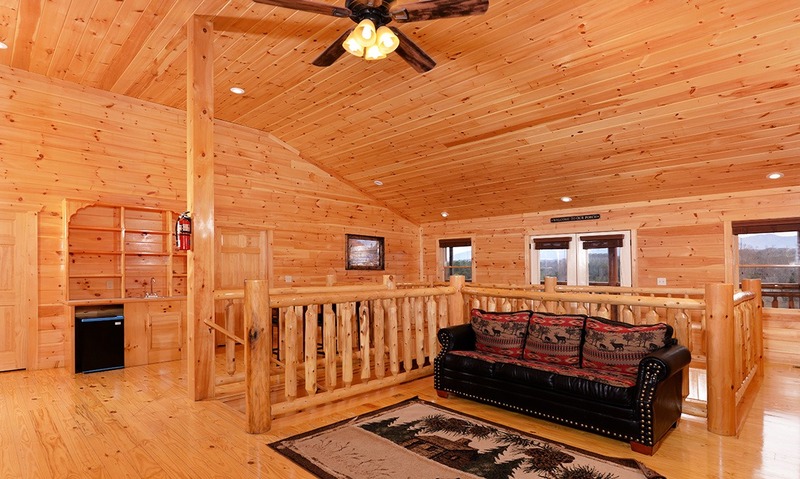 If you’re looking for a cabin that’s going to offer all the convenient and extravagant amenities on your list, check in to Splash Mansion! Handicap features: Two king-size bedrooms are located on the main level, with walk-in showers specially made for wheelchairs. The front door and pool doors have 33-inch clearance, and the roll-in shower features 55-inch clearance. 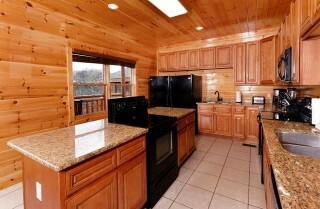 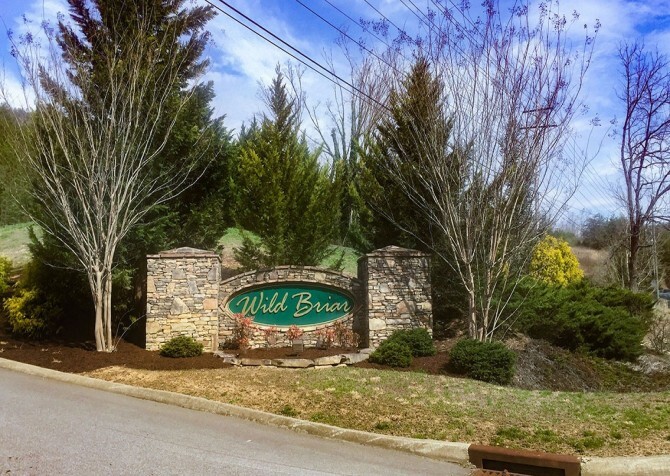 Less than 4 miles from Splash Mansion is the reason many people return to Pigeon Forge year after year. Dollywood has something for everyone with roller coasters, live music, good food, and so much more! 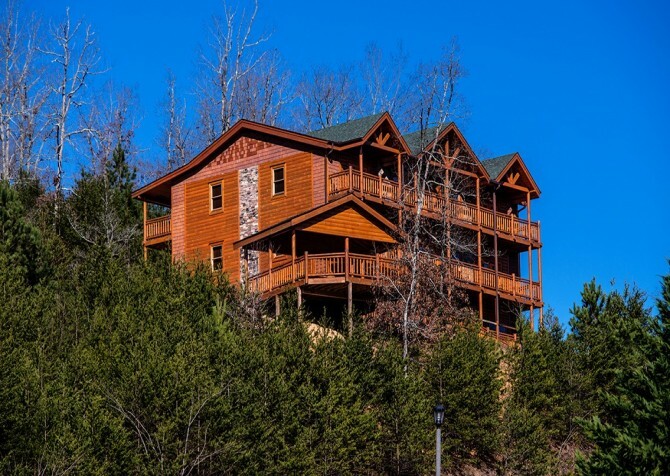 Shopping, arcading, moonshine sipping, rope climbing, Great Smoky Mountain Wheel-riding: these are just a few things you’ll find at one of Pigeon Forge’s newest attractions, The Island! *Ask about group discounts and ticket combos if you’re wanting to visit both Dolly Parton's Stampede and Dollywood.